From Wednesday 7 to Sunday 11 of September, a group of up to 28 pilgrims formed by patients with heart disease and their companions will travel the Camino de Santiago in five stages. Exactly conclude the pilgrimage route from the town of Tui to Santiago in the last 100 kilometers of the Portuguese Way with the aim of combining the benefits in these patients of exercise and life experience that is the Camino de Santiago. 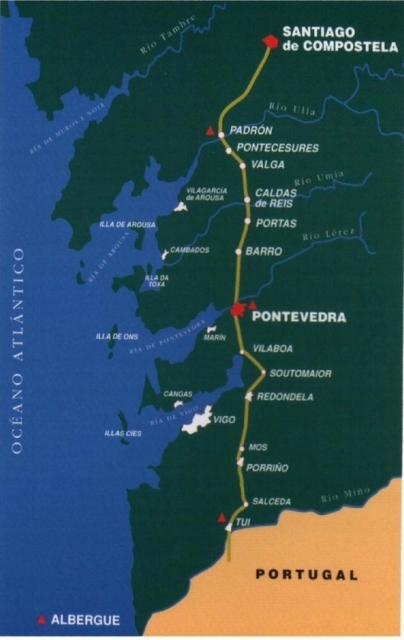 The pilgrims will visit the towns of Tui, Redondela, Pontevedra, Caldas de Rei, Padron and finally Santiago de Compostela. The initiative, which is run by Asociación de Corazones Unidos por la Salud in collaboration with Fundación Española del Corazón (FEC), is celebrating its tenth consecutive year with great success. The pilgrims will visit the Portuguese Way for five days, plus a visit to the city of Oporto during Tuesday and will have a support vehicle, plus a defibrillator and specialized guide. Una iniciativa muy interesante, y se ve que van preparados por cualquier incidente que pudiese pasar. Que lo disfrutes y que nos cuentes la experiencia cuando lo termines!